Carla Bruni, a B- to B+ pop chanteuse of her own accord, who sings in French and has released three well-received albums including the 2008 Comme Si De Rien N’Etait (As If Nothing has Happened), will have time to become even more acquainted with her new decadent troubadour friend, since Pete Doherty has a French tour planned for the fall, including dates in Paris, Toulouse, Monaco and Lyon, along with UK and Ireland shows. He’ll also be headlinging the Festival Republic Stage at Reading and Leeds this month. “Que vous le dealer?” – the youthful libertine asked. “I am your partner,” Carla replied, her bosom suddenly flushed and her breathing faster, “in music,” she added, falling into his full brown eyes. 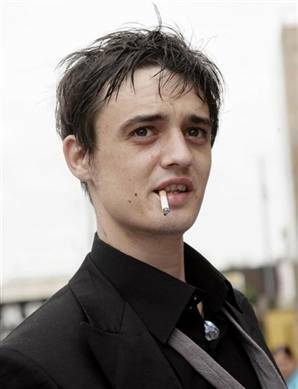 Babyshambles Secures Astralwerks Release for "Shotter's Nation"